Stanford Advanced Materials (SAM) specializes in producing high quality magnesium oxide of pharmaceutical grade. We are able to deliver by metric ton. Other magnesium products such as High Purity Magnesium Lump, High Purity Magnesium Ingot and Magnesium Alloys are all available. 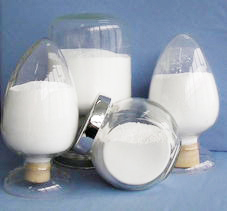 Magnesium oxide, also known as magnesia, is a white powder, insoluble in alcohol and almost insoluble in water. It is applied in the manufacture of antacid preparations, mineral supplements and pharmaceutical grade magnesium derivatives. For bio-pharmaceuticals, pharmaceutical grade magnesium oxide can be used as a neutralizer, heavy metal ions absorbent, desulfurizer, etc. Our pharmaceutical grade magnesium oxide is clearly tagged and labeled externally to ensure efficient identification and quality control. We make sure the product free of moisture and avoid any damage during storage or transportation.